I just came across an article with the provocative headline “Use of dietary supplements lead to 23,000 emergency visits each year” based on a 2015 NEJM study. This article seems to be suggesting that supplements are hazardous and should be avoided or at least more heavily regulated. Actually, they explicitly quote a physician who talks about the untested-ness and unregulated-ness of dietary supplements. It also said that of this estimated 23,000 ER visits each year, there are “more then 2,100 hospitalizations”annually from supplements (average hospital admission from ER visits is 11.9%, a little more frequent than the 9.1% admission rate we see here). That sounds like a lot of visits and hospital stays. Are supplements really that dangerous? Nearly 100,000 seniors are admitted to the hospital annually because of emergencies caused by adverse drug events. That’s over 47 times the number from supplements and that’s just in seniors. Apparently, even mirrors are more dangerous than supplements with 24,943 mirror-related injuries in 2014. There are even more injuries from sound recording equipment (44,278) and television sets and monitors (61,136). Interestingly, protection devices (12,829) injuries seem to be a bit safer than supplements, but do remember that ER visits for supplements are often just that someone took a lot or an unknown number of a supplement and are going to be sure it’s safe, so in many of these cases, there is no actual injury - just worry. So, certainly, it’s worth paying attention to what you are taking and not throwing caution to the wind, but supplements are hardly the public health hazard that articles like this are trying to imply. Last fall, I was interviewed in the Crazy Wisdom Journal (CW is a local bookstore and hub for local healing arts), and the interview was recently published. Like all written materials, things have changed slightly since it was written, but it’s mostly up to date. It’s pretty in-depth and long, but I don’t think it’s too boring to finish. For people who want to get a better idea of my philosophy of health care, this is a good read. Also, for people who like to nitpick, there is a small error on page 44 (don’t worry, it starts on page 42: it’s not that long) where I said “disease sensitivities” instead of “food sensitivities”. In any event, it is a decent read and the PDF can be found by clicking here (the article starts on page 42): The Crazy Wisdom Interview with Malcolm Sickels MD, or if you’d like to read it in your browser, click here for the flip book. A new study came out which adds to a previous study showing that the vaccine reduces the burden of illness by 50% and the incidence of post-herpetic neuralgia (where the pain of shingles never goes away) by 60%. In the new study, it looks like the benefit of the vaccine drops dramatically after the fourth year, so people would need to get a new shot every 5 years or so. So, the cumulative risk reduction is about 50% for getting shingles and 60% for getting post-herpetic neuralgia, which sounds great, but what does that really mean for the person getting the shot. After all, if you wore a metal helmet around all the time, it might reduce your risk of getting killed by a meteorite by 50%, but the risk of getting hit my a meteorite is so small in the first place (less than 1 in 5 billion/year) that it’s not worth the trouble to wear the helmet. In the study, the annual risk of getting shingles in seniors was 1.1% without a vaccine and 0.54% with the shot, meaning 0.57% of the people who get the vaccine will avoid shingles because of it. Put another way, if 175 people got the vaccine 1 person wouldn’t get shingles because of it. Usually, shingles is a temporary annoyance (about 1 in 8 seniors getting shingles will get post-herpetic neuralgia), so 175 shots and $38,500 (around $220/shot) seems like a lot to prevent 1 case of shingles. But wait! The shot gives similar protection for about 5 years, so we have to amortize that cost over 5 years: 35 shots and $7,700 to prevent 1 case of shingles. However, post-herpetic neuralgia can be quite devastating, so what does it cost to prevent that? The risk in seniors is about 0.14% per year and goes down to 0.046% with the shot, so 0.09% of those who get the shot will avoid post-herpetic neuralgia each year. That’s 1087 shots, but spread over 5 years it’s only 217 shots to prevent 1 case of post-herpetic neuralgia at a cost of around $48,000. Compare that to the risk if avoiding a second heart attack by taking a statin: 50 people taking it for 5 years to prevent 1 heart attack at a cost of (say $20/month on the cheap end: $1200/person x50 people) $60,000. What does all this mean to you? If you are a senior and get a shingles shot (for about $220), you have a 1 in 35 chance it will prevent you from getting shingles over the next 5 years and a 1 in 217 chance it will prevent you from getting post-herpetic neuralgia in the next 5 years. Better odds than wearing a meteor-protecting helmet (everyone on the planet would have to wear one for a few years to prevent 1 death from meteor), but still something to think about. Also, note that having shingles is at least as effective at preventing future episodes of shingles as the vaccine is, so no need to get the vaccine if you’ve had shingles within the past five years. Finally, understand that this is only looking at the simplest to measure outcome of the vaccine and monetary costs associated with it. Costs from side effects haven’t been discussed. Whatever immune dysregulation may occur from this vaccine is not only difficult to measure (it isn’t going to happen right away so would be hard to connect with the event of being vaccinated), but actively hidden (any reaction severe enough do trigger a lawsuit and prompt enough to implicate a vaccine bypasses the normal court system and goes to a special vaccine court, where all outcomes are kept secret, so there is no record of how much of a problem there is from any vaccine). Last monday there was an article in the New York Times on using alternative therapies for treating racehorses. Among the treatments discussed was hyperbaric oxygen for healing up muscles better and faster. It’s nice that the benefits of HBOT are getting some recognition. By delivering more oxygen to the tissues, it can speed wound healing and help bring damaged tissues back from the brink. There’s more and more data on the benefits of using it and we’re finally starting to see some research on the benefits of mild hyperbaric therapy (1.5 atmospheres pressure or less). I'm not crazy: aspirin for everyone? I sometimes start to wonder if I’m crazy when conventional docs continually and persistently do things that I’m sure are a bad idea. Are they all practicing bad medicine or am I crazy? It’s nice when I’m reassured that I was right all along. This time, it’s about aspirin. Whenever anyone over the age of 35 goes into a doctor’s office, it seems like the doctors routinely put them on an aspirin a day. The dose of aspirin depends on the doctor’s specialty: primary care docs recommend 81mg and cardiologists want people on 325mg or more. Ostensibly, the aspirin is to reduce the risk of heart attacks. It reduces the stickiness of platelets (which make blood clot), making them less likely to clump and clog up arteries and cause heart attacks and ischemic strokes (caused by a clot). However, aspirin is (like most drugs) not an entirely benign substance. It can cause bleeds in the stomach and intestine, which can be worsened by the anti-clotting actions of it. In addition, it can increase the risk of any type of bleeding, particularly hemorrhagic strokes (caused by a bleed rather than a clot: less common but worse). Recent research has demonstrated that while aspirin does reduce the risk of another heart attack in people who have had one, it isn’t so impressive in people who have never had a heart attack. In particular, the only people who haven’t had a heart attack yet who should be candidates for daily aspirin use are people over 45 (men) or 55 (women) who are already at high risk of a heart attack and don’t have risk of bleeding (BP is close to normal and not at risk for falls). Now the big question: if some should get aspirin, what dose should they get? Once again, the primary care docs provide better care than specialists: 81mg provides better risk reduction and less increase in risk than 325mg. In fact, it appears that higher doses of aspirin might blunt the anti-platelet effects in addition to increasing the risks of adverse events (however it appears that cardiologists might not be reading their own journals like Chest). So, how effective is it? Well, 119 high-risk men under 60 would need to take aspirin for 5 years to prevent one heart attack. Over those 5 years, there is a little more than a 1 in 3 chance that someone in that group will have a major intestinal bleed because of the aspirin. Put another way, if we took 1000 men with a 6% 10-year risk of hart attack and gave them aspirin for 10 years, we will have prevented 19 heart attacks (dropping the number from 60 to 41), caused 8 major bleeds and 1 hemorrhagic stroke. Men can look up their risk/benefit ratio here. In women, the benefit is less impressive: the chance of preventing a stroke is less and isn’t that different from the chance of causing a bleed. Women can look up the specific risk/benefit ratios here. However, if you are having a heart attack, one of the best things you can do (in addition to calling 9-1-1) is chew up and swallow an aspirin. I’d still make the phone call first, though. While the influenza vaccines have become a ritual in the fall, there is no reasonable evidence that they do any good. By examining death rates during times when there was a shortage of flu vaccine (2004) or there was a completely ineffective vaccine (the strains that hit the US weren’t any of the strains that were in the vaccine in 1968 and 1997) we see that the lack of effective vaccination does exactly nothing to the death rate, ergo the vaccine doesn’t affect the death rate. In a best case scenario, the vaccine would only build up antibodies in people with robust immune systems. These are not the people who are at risk from the flu. Evidence for benefit of antiviral medications is about the same quality and timbre as for the influenza vaccine. On average it only knocks 1 day off the time someone’s sick with the flu (at $10/pill taken twice daily), and Gilead (who makes Tamiflu) was required to take back its earlier claim of benefit for the medication by putting this up on their website: “Tamiflu has not been proven to have a positive impact on the potential consequences (such as hospitalizations, mortality, or economic impact) of seasonal, avian, or pandemic influenza.” (Also note that Donald Rumsfeld, a major stockholder of Gilead’s, was Secretary of Defense when the military got $1.8billion to stock up on Tamiflu and then his president asked congress to approve legislation for another $1billion to stockpile more–all of which led to a greater than 50% jump in the stock’s price.) All this for a 20% incidence of medication side effects that seem to be worse in children. Also, viruses mutate so quickly that using lots of antivirals when not absolutely necessary will only lead to widespread resistance and a loss of whatever benefit they might give. The medical establishment has decided that flu shots are good despite the lack of decent evidence for it and will attack anyone saying otherwise. Mr. Adams labels this as quackery (a fair turnabout of when orthodox medicine accuses others of practicing things not supported by evidence). The writers say that no one knows why there’s more flu in the winter, which is technically true. However, a good deal of evidence points to less sun exposure and lower vitamin D levels as a major component of the increase in incidence. Read point 3 at the end of my last article on swine flu to see some of the evidence or go read more at the vitamin D council’s website. The 1918 “Spanish Flu” that killed 40-100 million people is the pandemic flu that everyone is worried about. It’s thought that if we had another like it we would be in trouble and this is why everyone gets so excited about H1N1. However there are several differences between then and now. 1918 was near the end of WWII, so health care and nutrition were pretty bad across the world. In 1918 there were very few antibiotics, so the secondary pneumonias that would kill people were left unchecked. Finally (as pointed out by Dr. Starko in Clinical Infectious Diseases and discussed in the NYT science section), 1918 was when global marketing for that new “wonder” drug aspirin was in full force (the patent had just expired and Bayer fought to preserve its marketshare by using massive advertising campaigns while other manufacturers pushed to build their markets) and the surgeon general and the US Navy both recommended using aspirin for the flu (we now know that using aspirin in a viral illness can cause Reye’s syndrome and so discourage it’s use during viruses) while the recommended dose was double the maximum dose used today. These massive doses of aspirin can cause the symptoms exhibited by the people who died early in the course of the disease. So, with late deaths looking like bacterial pneumonia and early deaths looking like aspirin overdose, it’s certainly reasonable to think that even if the same 1918 Spanish Flu virus came around again there would be much lower rates of complications and death. Finally, the article in the Atlantic offers a useful sidebar with answers to questions about H1N1 influenza and immunity. It does a good job of delivering the basic information about the flu, treatment and vaccination, including the tidbit that nearly all the current flu is H1N1 so the current seasonal vaccine is essentially useless even if it did work. Two interesting opportunities to Learn Useful Things About Health (something I quite enjoy doing and highly recommend) are coming in the next couple days: an opportunity to get a pile of free stuff just for buying what should be a good book (provided you do it on November 8 at Barnes & Noble), and the second BHRT World summit. 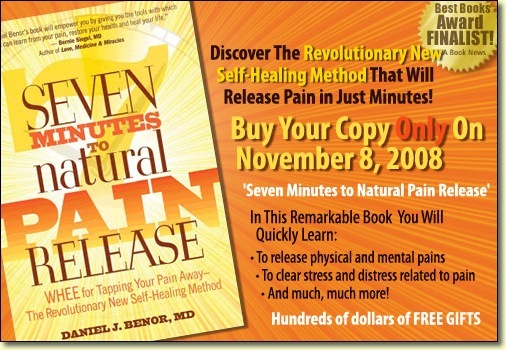 Dr. Dan Benor, MD, (a doc I’ve been familiar with for a few years and who seems to know what he’s doing) has a book out about a simple and rapid method of releasing both physical and emotional pain, 7 Minutes to Natural Pain Release. The urgent part is that if you buy the book at Barnes & Noble on November 8, 2008, you can then use the receipt to get a pile of free bonuses: interviews with the author, audio seminars and classes on a variety of health topics, and a pile of e-books (including “Caring, Housing and Health of Your Dog”, which is what tipped me into deciding to get it on Saturday). The book is only $18, though if you decide to forego the bonuses or miss November 8th you can get it as an e-book for only $10. You can follow the link or click on the picture to see the bonuses. The other upcoming opportunity is the second BHRT World Summit, starting November 10 and continuing through November 25 with interviews with 10 health experts about bio-idential hormones and other therapies. The interviews are aimed at the general public to educate you about some more holistic approaches to improving our health. There are 3 options for taking part: $29 to get the interviews on the days they are broadcast only, $49 to listen to them whenever you want, or $120 to listen anytime and get a transcript of all the interviews and downloadable files of all the talks so you can listen away from your computer. I got the complete package last time and, while there were a couple small points where I disagreed with the doctors, was glad I got it and even I learned a lot from the talks. You could learn a lot, too. Follow the link or click on the banner to sign up. There’s a few bonuses with this, too, so check it out. When I had a layover thursday on the way to the ACAM convention, I ran into a woman who’s had multiple medical issues and was walking around with a backpack full of medications. She’s been going to a variety of specialists and overall her problems have been dealt with using a variety of medications. As we got to talking, she shared some of her diagnoses with me and I mentioned some other avenues she may want to investigate. Now, I will probably never see her again, but she stayed on my mind as she’s a complex medical case. With the variety of problems, most doctors get frustrated and throw up their arms in frustration or try the couple therapies they have at their disposal then reject the patient if they don’t work. This doesn’t help the patient. So, perhaps she will have a chance to read this and be able to take advantage of some of these therapies (I’m only including the diagnoses and avoiding any personal details so she’ll be the only one who can identify herself from this information). For everyone else, you’ll get a chance to see the approach that I take. Her problem list includes (I wasn’t taking notes, so this relies on my memory and may have some errors): thyroid cancer in the past (eventually had entire thyroid removed) but doing well until last winter when she had sudden onset of attacks or episodes of (I don’t remember the details) fatigue and palpitations. Since then she has been diagnosed with multiple sclerosis (can only tolerate one MS drug), bone loss, massive iron deficiency anemia, massive vitamin D deficiency (I think she said she needed 60,000iu weekly just to bring her to perceptible levels, Ehlers-Dahnlos (not type 4), autonomic dysfunction, mast cell instability, hypoglycemia, orthostatic hypotension, some muscle/tendon shortening from limited use, and probably a few other things. She has tried an elimination diet in the past, eating nearly exclusively chicken and rice and felt weaker and lost weight during that time. History of thyroid cancer and now completely without a thyroid: with her other problems, she may not be converting T4 (in synthroid, what is usually prescribed) to T3 (the active thyroid hormone), sometimes lab tests can help but sometimes you just have to do a trial of the different forms (Armour thyroid, cytomel, or compounded thyroid hormones) and see where the patient feels the best. For her MS: Estriol (one of the estrogens, this is the weakest estrogen and least inflammatory) ~6 mg daily (this is the estrogen that is most elevated in pregnancy which is one time women with MS have fewer symptoms, a trial of estriol showed reduced white matter lesions in women with MS on estriol) applied transmucosally (this avoids the first pass liver metabolism that gives more metabolites from taking pills); vitamin D, enough to get her blood levels up to 60 ng/ml (plenty of data showing a connection between low vitamin D and MS); low dose naltrexone 3-4.5 mg before bed (learn more about it from this website); it’d be good to check her stomach acid production as it’s typically low in people with MS (I had a patient the other day who took nearly 2 hours to reacidify her stomach, normal should be under a half hour, so this means food isn’t getting digested). Bone loss: she’s already taking calcium and magnesium, but extra magnesium may be warranted and the form of calcium certainly matters in someone who’s likely low in stomach acid (and another reason to check her stomach acid); enough vitamin D is essential for calcium metabolism so we’ll make sure she’s over 60 ng/ml; estrogen can help keep her bones strong and we already have another indication for using estriol and progesterone can help to encourage growth of the bones while testosterone (bringing back up to normal levels only) is also important for keeping bones strong; weight bearing exercise; maybe some additional supplements to support her bones. Iron deficiency anemia: she can’t tolerate regular iron (ferrous sulfate), so while some IV iron may get her levels up right away, she should take a more gentle iron like bis-glycinate or some other chelated iron and take it with vitamin C to increase absorption; also, resistant iron deficiency anemia is a red flag for gluten intolerance or helicobacter pylori infection, so those need to be ruled out. Ehlers-dahnlos: this is a connective tissue disorder that is typically genetic, so without knowing what the genes in her situation are coding for (they code for enzymes and other proteins so knowing where the defect it you can sometimes get around it) I would at least recommend a decent amount of vitamin C since it is essential for collagen formation and making strong tissues. Mast cell instability: quercetin is a bioflavanoid that stabilizes mast cells and may be more effective than the cromolyn that she’s taking now (see this book). Orthostatic hypotension: licorice can help retain sodium and may help her get her blood pressure up, though she may well have adrenal problems so a thorough evaluation of them would be warranted. Autonomic dysfunction: once again, adrenal problems here, too, though this is a shoe-in for the environmental illness work-up below. Hypoglycemia: small frequent meals is the mainstay of treatment here, but using more protein and fat can stabilize things a bit; sometimes food allergies can be an issue here. More thorough allergy evaluation and repair of the gut may be warranted, perhaps she’s allergic to chicken and that’s whey she did so poorly. Heavy metal testing: sometimes heavy metals can trigger all these weird symptoms, and remember that chicken is often loaded with arsenic. Environmental illness: toxic mold (were there some water leakage problems in her house?) or some other environmental stressor can lead to this seemingly hopeless array of problems, so a work-up by someone who knows about environmental medicine is warranted. Yeast: sometimes candida can become systemic and cause lots of weird symptoms, but I don’t recall her having much of an antibiotic history so it depends on the history and presentation. Other infectious cause: lyme disease can sometimes cause a host of strange problems, and conventional testing isn’t fantastic, so even a trial of therapy could be warranted. So, perhaps this short list of possible approaches just off the top of my head (I’m away at a conference on integrative treatment of cancer right now so don’t have access to my references) will be helpful for people to understand how I approach things and perhaps they will help this person if she happens upon my website. The other day I had three patients independently and spontaneously tell me they had discovered they are allergic to wheat. I've seen a lot of people make huge improvements by removing foods that bother them, and frequently suggest allergy testing or an elimination diet to root out these problems. The interesting thing on this day was the diversity of the symptoms that resolved with removing wheat from these people's diets. One patient found that when he went off wheat, his thinking became much clearer (he's been diagnosed with bipolar disorder and attention deficit) and he stopped using the lithium he had been prescribed since he didn't need it any more. In addition, his chronic runny nose and reflux symptoms went away, problems he was having with dry skin on his face resolved, he lost weight and he's performing much better at work. Upon re-challenge with wheat, he started getting a dry rash on his face which resolved with avoiding wheat again. Another patient found that his chronic eczema and hives improved when he stopped eating wheat. The third patient eliminated wheat and this was the only thing that improved her intense sugar cravings that had originally brought her in. She also found an improvement in her energy levels and that re-challenge with wheat makes her feel terrible and gives her a runny nose, canker sores and fatigue. Unfortunately, I don't have consistent testing between these three people due to individual circumstances and finances. Gliadin antibodies (from conventional labs) on all three were negative (gliadin is one part of the gluten protein that can trigger gut reactions). IgG and IgE antibodies (through a conventional lab) on one patient showed moderate IgE antibodies to wheat (this is characteristic of eczema) and very low IgG antibodies to wheat. One patient had a combined IgE/IgG4 antibody test through a specialty lab that did show high levels of antibodies to wheat and gluten. I have had other patients who didn't turn up any positives to conventional IgG/IgE testing despite profound symptoms that improved with removing wheat. On the heels of this, an article came out in American Family Physician (a journal for family docs) that maintains the doctrine that only IgE mediated reactions (which can be elicited with skin-prick testing) are food allergies and that most things that are called food allergies aren't. While that may satisfy allergists (for whom skin-prick testing is a significant part of their office income), it does little for the patients who have sensitivities to foods that don't show up on skin testing, and they are often dismissed by physicians who don't know that there is more to it than just IgE reactions. Some of the early work on food allergies was done by allergists, but the specialty has veered over to simple skin testing (which rarely shows food allergies) as the standard for allergy testing, leaving all the patients who don't show up with it out in the cold. Fireworks tomorrow, 31 days early! In case you haven't heard, Wyeth, the maker of Premarin and Prempro (Premarin + Provera), has been plotting to maintain their marketshare by restricting women's freedom to choose safer medications for themselves. Ever since the Women's Health Initiative revealed in 2002 that Prempro increased the risk of stroke, breast cancer, heart attacks, and blood clots (a finding that I, in residency at the time, thought was obvious since Provera was well known to increase the risk of clots), Wyeth has been struggling to maintain its sales of these patent medicines. Wyeth has managed to keep a monopoly on PREgnant MARe urINe (PREMARIN, get it?) products in the US since it was introduced in 1942 by dubious legal and political maneuvers including using at least seven women's advocacy groups it funded to influence congressional hearings in 1995. By maintaining this stranglehold on relief of menopausal symptoms, Wyeth has extended its dominion well past the 20 year patent protection and in 2001 had over 11 million women using its hormone medications and over $2 billion in sales of those medications. Following the revelations of the Women's Health Initiative, sales of Premarin and Prempro drop and by 2006 sales are half of 2001 levels (though they had dipped even lower before Wyeth made lower strength versions and pushed for more prescribing). As women flock to safer treatments like bioidentical hormone replacement (using hormones identical to the ones originally in the women's body), Wyeth decides to protect its profits at the expense of women seeking relief of menopausal symptoms and preventing other changes related to loss of estrogen like osteoporosis and memory loss. In 2005, Wyeth files a "citizen's petition" with the FDA that pushes the FDA to ban estriol, an estrogen naturally produced by women, as an unapproved new drug. Within 70 days, 11 organizations, mostly funded by Wyeth (in a stunning repeat of their tactics 63 years earlier), submit letters of support for this petition. Again, May 19, 2008, members of congress received a letter (coordinated by Wyeth) from 14 organizations (all with major funding from Wyeth) supporting the FDA's actions. Besides estriol having a 50 year history of use and listing in the US Pharmacopeia, it was in the precursor to Premarin (that was made from pregnant women's urine- but it proved too difficult to collect), and is used by Wyeth itself in products sold overseas. Recent research has shown estriol may reduce the risk of breast cancer and be beneficial in treating multiple sclerosis. This year, in response to Wyeth's petition, the FDA bans the use of estriol (though the FDA does not have jurisdiction over compounding pharmacies, so this is also a power grab by the FDA) despite admitting that there have been no reports of adverse events associated with its use ever. Somehow, the FDA has managed to put an import restriction on estriol as well, so even though compounding pharmacies shouldn't be subject to the FDA's decrees they are having trouble getting supplies of estriol. Under the FDA's plan, it would require a physician to file an Investigational New Drug form (with the associated $50,000 fee to the FDA) to order estriol for patients. In the end, women are losing their options so Wyeth can make more profits. So, what's with the fireworks? Well, Tuesday, June 3, is the day that hundreds of compounding pharmacists will descend on capitol hill to support H. Con. Res. 342 at the same time the AAHF is delivering independent letters of support, and a full page ad will appear in Roll Call. Learn more about this issue here, and learn more about estriol specifically here. Corporations will only be able to get away with this as long as we remain quiet, so speak up for this and get active in politics: corporations pay big money to bend the laws in the direction of increased profits whatever the human cost, so the humans have to speak up. It's time. Dr. Wright joins the fray! Yikes! I just found out that Dr. Jonathan Wright has joined up as the 11th speaker for the BHRT World Summit that starts tomorrow. Now there's no excuse not to listen in! Also, they've relaxed the listening constraints for the $10 option so you have more flexibility about when you listen. I just found out there's an interesting series of audio conferences coming up: the BHRT World Summit. It starts May 14 and runs through June 2. Lots of doctors who use bio-identical hormones are lined up for this, though I've only heard of a few of them. Sadly, my favorite BHRT guru, Jonathan Wright MD, isn't on the slate. It does look promising. I'll check it out myself, too, even though it's aimed at regular people. They'll let you listen in each evening for only $10 for the whole series. They also have additional options to listen to the interviews, either by listening on your own schedule or even getting CDs and text from the interviews. Yes, I know the banner says it ends May 29, but they've added more interviews, so it's an even better deal. I just came across an article about a lottery in Oregon for covering healthcare expenses. The woman mentioned in the story is $15,000 in debt from the year's treatment of her Crohn's disease. I've learned of a natural therapy for Crohn's disease that achieved remission in 62% of patients and improvement in 76%, much better than conventional medicine. When I initially looked into it, I thought it was expensive, with a standard first course of therapy costing in the neighborhood of $4000, but now I see that is substantially less than then conventional treatment and with much better outcomes. The treatment does seem a bit odd, but the science makes sense and it seems to work. The duration of remission is longer the younger people are, with the elderly maintaining remissions up to 2 years. It seems like it may be helpful in other autoimmune disorders as well (asthma, MS, eczema, psoriasis, food allergies). Time will tell. I remember the first time I came across Airborne at a regular grocery store. I was a little taken aback that the box was so boldly asserting itself as a "miracle cold buster". I figured that with that tall claim on the outside of the box, they must have some good data to back it up or they'd be eating their words. Turns out they are eating their words for this advertising: they are offering refunds to people who bought it between May 2001 and November 2007 as part of a settlement for false advertising. When I first saw Airborne, a quick look at the nutrition facts showed it had some reasonable stuff in it: a gram of vitamin C, a good bit of vitamin A, and a smattering of other nutrients and herbs. While the mix of nutrients seemed OK, I noticed that it has mineral oil (a petroleum product) as an ingredient and wasn't eager to buy it since. Later, my wife brought a tube of it home and I had a opportunity to look at the ingredients a little more closely. Besides mineral oil, it also has sucralose (the same stuff that's in Splenda), an artificial sweetener that may have some health effects. Not something I' d eagerly put in my body nor would I recommend it to others. If they're making poor judgements about the non-nutritional ingredients in the product, why should I trust them about the nutritional ones (remembering that there is virtually no oversight of nutritional products: the FDA only looks into them if there is a complaint, and (besides being chronically underfunded) is too busy harassing (at the behest of Wyeth) compounding pharmacies for using a safe naturally occurring hormone in hormone preparations to do anything useful)? Seems like a good reason to get a refund for the tube that we've barely touched. An interesting side note (in case I haven't made enough already) is whether this offering refunds really means anything since the tube already declares "100% Guaranteed Satisfaction", so they'd be potentially giving refunds to anyone who wants one already. Once again, the consumer gets precious little while the lawyers get a big chunk of the $23.3 million settlement. I had the pleasure the other night of having dinner with Richard Linsk MD, a pediatrician who has recently opened an office here in Ann Arbor on south Main street. He's focusing on the treatment of autism and ASD, and does general pediatrics. He used to be in the University of Michigan health system, but as he started doing more treatment of autism he invoked the ire of the systems' autism "specialists" (who don't seem to do much more then sedate the kids) and has had to branch out on his own. In talking with him that evening, I came to appreciate his tremendous honesty. Not only is he honest about his own limitations (an unusual feat in most doctors), but his honest perception of the shortcomings of conventional treatment are what drove him to expand into functional medicine and other modalities. During dinner, I realized that he was one of the pediatricians I had rotated with in medical school (over 8 years ago). He was working out of a small building with a couple other pediatricians and I ended up spending most of my time there with him. Something about him made me think I had the most to learn from him, and in retrospect I think some of it was his willingness to seek the truth despite the pressure of being harried with a full (over) load of patients and those annoying medical students. In addition to his regular office visits, he offers HBOT in roomy chambers (that you can rent out) and single-reagent immunizations. His website is www.integrativepediatrics.net. Hyperbaric Oxygen and the "noncovered conditions"
Hyperbaric Oxygen Therapy (HBOT) is quite useful for a number of conditions, though the medicare laws have a curious and unusual statement about HBOT: a non-covered conditions list. Most therapies' entries in the medicare laws don't even list covered conditions, so why does this specifically name 22 conditions as being "non-covered"? This is especially interesting because the 22 conditions are all clearly effectively treated by HBOT. The last issue of Hyperbaric Medicine Today has an interesting article about how this happened. You can go read it yourself at http://www.hbomedtoday.com/PDF/HBOMT_8.pdf The article starts on page 7, you'll have to scroll down to it in the acrobat file yourself. Interesting reading. If you'd like to read some information about HBOT by physicians who use it, try here. You can read a (relatively) short bibliography of research on HBOT here. As the author of the "noncovered conditions" list points out, there is no law against using HBOT for these conditions, they are merely off-label uses for HBOT. There are also articles about using HBOT for migraine and Lyme disease (which medicare presumably won't cover either, nor, by extension, would insurance companies). And since I have a special interest in MS, I dug up this page which is the beginning of a discussion on HBOT for MS.
Why do I take this interest in HBOT? I managed to get my hands on a modest chamber and have been looking into using it therapeutically. Thorne Research came out with an editorial that nicely summarizes the problems with some of the recent, well publicized, studies that can be construed to show that supplements are ineffective. However, looking at the actual studies clearly shows they do work. For the full story, read the article. Nice articles further substantiating the environmental connections to thyroid and heart disease/stroke came out recently. I added the links in the "useful health resources" section of the Links page. While writing an email on a list for med students I came across some interesting links that I added to the Links page.